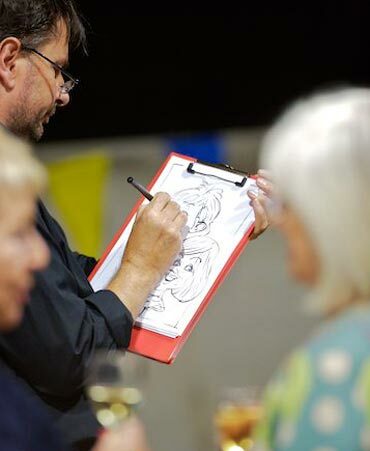 I have over 20 years experience working as a live caricaturist. In that time I have done practically everything. Ranging from drawing Mr Ryan (he of the low cost airline) on one of his aircraft chartered for his 60th birthday through to working for Motorola on top of the Schilthorn mountain in The Swiss Alps at the famous Piz Gloria restaurant. I have travelled as far as Curacao in the Caribbean to work for KLM right down to drawing disadvantaged children at a summer outdoor activity camp one and half miles from my home! (the only job I have done that I have been able to walk to) Throw in France, Germany, Holland, Sweden, Finland and Iceland in Europe, Morocco and Egypt in North Africa and finally Dubai and Abu Dhabi in the Middle East for good measure. Not forgetting practically every major town and City in the UK (Apart from Grimsby!) I know every Motorway Service station there is to know plus a few hidden gems where only the locals go! Recently my wife and I were taking a pleasure cruise on the Thames from Westminster down to Greenwich, and I couldnt help pointing out to her as we passed all the landmarks and famous buildings... I have worked there... I have worked there...etc. These included the Houses of Parliament and Tower Bridge amongst others.